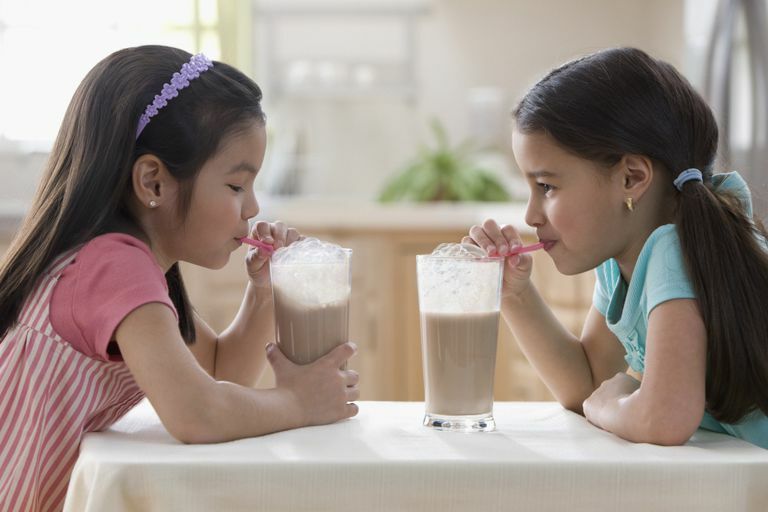 Is Chocolate Milk Healthy for Kids? Milk is often thought of as an important part of a child's diet, or more specifically, calcium and vitamin D are important nutrients that kids need. To make sure that their kids drink milk, some parents resort to giving them flavored milk, including strawberry milk or chocolate milk. In addition to flavoring regular white milk with Nesquik Chocolate Powder or Hershey's Chocolate Syrup, other parents use products such as Ovaltine and Carnation Instant Breakfast Powder Drink Mix. While regular white milk is usually considered to be a healthy drink, adding chocolate flavoring usually adds extra sugar and calories. In 2011, celebrity chef Jamie Oliver went so far as to convince the Los Angeles School District's superintendent John Deasy to ban flavored milk in L.A. schools. He used the argument that chocolate and strawberry-flavored milk has as much sugar as a can of soda. The chocolate milk wars ended with the Los Angeles Unified School District voting to take flavored milk, including chocolate milk and strawberry milk, out of their schools. Perhaps one benefit to chocolate flavoring is that it might encourage your child to drink milk when he might otherwise not drink plain white milk. But even then, you are probably better off trying to give your child alternative sources of calcium, such as cheese, yogurt, and calcium-fortified orange juice, etc. Another benefit is that many chocolate flavorings are now fortified with some extra calcium and other vitamins and minerals, so if your child doesn't drink much milk or other things with calcium, then it might be a good way to make sure he gets enough of this important mineral. And in the case of Carnation Instant Breakfast Powder Mix, in addition to the chocolate flavoring, you can give your child extra iron, calcium, protein, and many other vitamins and minerals. Ovaltine has extra iron in it too. If your concern is added sugar and calories, a number of reduced sugar versions of chocolate and strawberry flavorings for milk are now available. Again, the biggest case against chocolate milk is that adding any flavoring to milk adds extra sugar and calories to an otherwise healthy drink. Even the newer 'no sugar added' varieties, like the Nesquik Chocolate No Sugar Added brand, has 3g of extra milk sugar and an extra 40 calories. And the more traditional varieties can add up to 24 of sugar and 100 calories per serving, which more than doubles a number of calories that you would get from just a glass of low-fat milk. And keep in mind that the no sugar added varieties use artificial sweeteners. Although milk is an important drink and an easy way for your child to get calcium and vitamin D into his diet, it is usually best to encourage your kids to drink plain white milk. Adding chocolate flavoring just gives your child unnecessary sugar and calories. If your child won't drink plain white milk, you might offer alternative sources of calcium before jumping to flavoring his milk with chocolate or strawberry syrup or powder, as it is usually difficult to get kids to later go back to drinking plain milk once they start drinking flavored milk. If you are going to give your kids chocolate flavored milk, you might offer it only as a once in a while treat and not on a daily basis. What about all of the extra vitamins and minerals that most chocolate flavorings now offer? You can get even more vitamins and minerals with a simple daily multivitamin that your child takes with her glass of plain white milk.